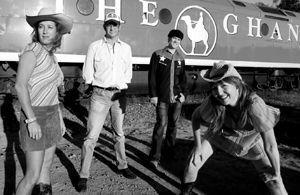 THE TOE SUCKING COWGIRLS return to Maitland's GRAND JUNCTION HOTEL on Saturday night. The band performed before an enthusiastic crowd at the venue two years ago and singer GLENYSS RAE said she was expecting a good turnout on Saturday . ``It's been a while, but we have caught up with many of the locals at various other gigs like Tamworth,'' Rae said. ``The Grand Junction has been putting on a number of great bands like the Red Hot Poker Dots and The Re-mains, so it's about time the Cowgirls had their say.'' Formed and based in Darwin, the Toe Sucking Cowgirls comprises Rae and musical partner TRACEY BUNN. The pair have Although the two have very different musical backgrounds, they discovered a shared passion for writing and singing songs with strong melodies and thought-provoking lyrics. In the tradition of bush balladeers and folk writers, their songs tell tales of the Australian outback, life on the road, love and ``cheatin' men and wild women''. Bunn plays rhythm guitar and Rae the fiddle and squeezebox. Rounding out the sound are bass player SAM `BOBCAT' MARTIN and drummer GRANT `HOTROD' BEDFORD. Following four years of touring Australia and abroad, the band recently completed its third album, which is due for release during next year's TAMWORTH COUNTRY MUSIC FESTIVAL. Rae said listeners could expect to hear a smorgasbord of new songs, including the addition of Cajun and Celtic styles. The album, Thirteen Thongs , was recorded by ARIA award-winning producer RICHARD PLEASANCE. whose past credits include DEBRA CONWAY and JIMMY LITTLE, in his mudbrick studio in the Victorian town of Hepburn Springs.Toe Sucking Cowgirls will perform at the Grand Junction Hotel on Saturday from 8.30pm. Entry on Saturday is free.